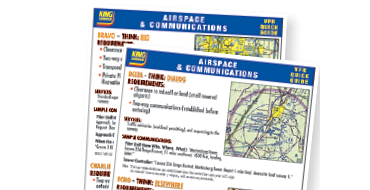 King Schools pilots and instructors have teamed up to produce a 4-color, laminated Cockpit Card of airspace graphics and memory aids with detailed information to give you the edge in your airspace navigation and communication. Review the requirements for entering each class of airspace (B, C, D and E) and sample communication exchanges ... so you have greater confidence for a smooth entry every time. Your Cockpit Card includes: full-color, two-sided, large graphics, laminated for durability and sized for easy kneeboard use 5.75" x 8.15".